Our hotel is the perfect choice: No matter if you go for sports and outdoor activities, or rather for relaxation and pampering spa treatments - we offer it all for families, children, sportsmen and wellness vacationers. Family Held warmly welcomes you! Looking for a traditional hotel with all the amenities and comforts of a four-star sup. hotel, a friendly atmosphere and unparalleled value for money? Indoor pool plus indoor whirlpool, heated outdoor pool plus outdoor whirlpool, sauna baths (7 different sauna parlors), bio-swimming pond, large garden, children's playground, 3/4 gourmet half board incl. breakfast buffet, lunchtime snack with salad bar, cake in the afternoon, 5-course dinner menu or themed buffets, "Shan Shui" spa and beauty area, new outdoor spa with heated swimming pool and Jacuzzi. Weekly activity program: walking, hiking, cycling, mountain biking, sauna sessions, gymnastics, useful advice by experts! Free rental of bicycles, hiking poles, nordic walking poles. Pets are allowed on prior notice. 18-hole tournament golf course in Uderns, covering 65 hectares. Located at only 5 driving minutes from our hotel. Tee-off times can be booked in advance! Looking for a wonderful Holiday Retreat? Are you in search of a house with tradition? A house with all top 4-star amenities, a warm ambiance and superb value-for-money deals? 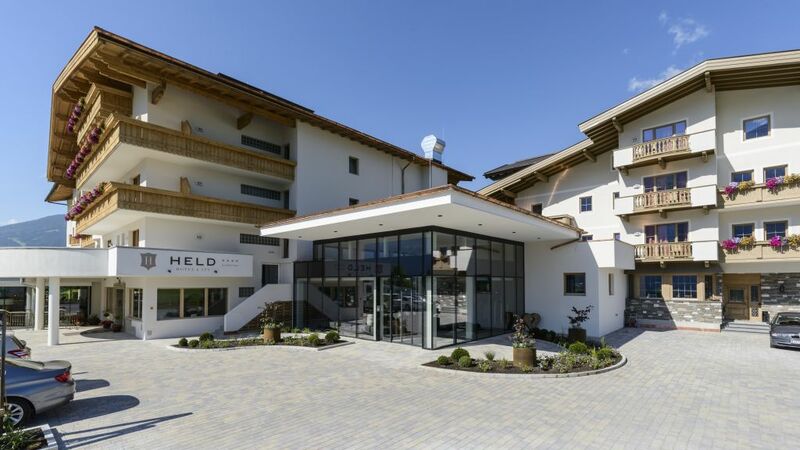 The HELD SPORTS AND WELLNESS HOTEL is located in the heart of the scenic Zillertal valley, amid snow-covered meadows and next to a beautiful cross-country skiing track. We offer a first-class, 3000m² wellness oasis where you enjoy peaceful relaxation 365 days a year. Facilities include: indoor pool, sauna baths, biotope, large gardens, playground, open kitchen with themed buffets, new "Shan Shui" beauty & wellness area, our new outdoor wellness area with heated pool and whirlpool. Come and be pampered from start to finish! We, the Held family and our team, are looking forward to welcoming you! Relax and unwind, balance your body, mind and soul. Our Beauty & Wellness Area has been finished with Feng Shui principles in mind to offer you an ambiance conducive to peaceful relaxation. We offer: facials, massages, manicure, pedicure, aroma baths and much more. Our professional team only uses top quality products and treatments based on Brigitte Kettner whose beauty treatments root in the holistic concepts of the Far East. Unwind with a pampering array of soothing body treatments! lunchtime buffet with fresh salads (12 noon to 3.00 pm), cakes in the afternoons (3.00 pm to 5.00 pm), excellent 4-course dinner menus of your choice with salad from the bar, tasty theme buffets, vegetarian dishes and light delights. Fresh spring water, juices, teas and fruit (during opening hours). Enjoy the luxurious sensation of a soothing steam bath followed by a plunge into the cold dip pool! After a fun-filled day in the invigorating outdoors you can relax and unwind in our Wellness Oasis with indoor pool, sauna baths, massages, and much more. Water World with heated outdoor pool, a 37°C hot whirlpool, indoor pool with counter-current area, massage jets, waterfall, massage grotto and an alpine pine relaxation room! And those of you who would like to practice a little more can use the fitness room. Our sauna area offers a Finnish sauna (95°), pine wood sauna, bio sauna (approx. 60°), sole steam bath, Roman steam bath (60°), multi-sensory showers, cold-fog shower, fresh air room and Kneipp basin - all that to use for free. Please contact us for Conferene facilities!